Our 8x8 guard booths are temperature controlled and provide plenty of room for two people to sit and work comfortably, while still allowing for communication and monitoring equipment. The occupants of a security booth will no doubt be sitting in this area for hours at a time and the environment is comfortable enough to stretch and move about. More importantly it is a practical unit, providing a good workspace area and excellent visibility out of all 4 sides of the guard booth. Seven - 36”x36” insulated sliding glass windows and an insulated metal door with a fixed nine light and divided window provide ultimate visibility, as well as plenty of light. 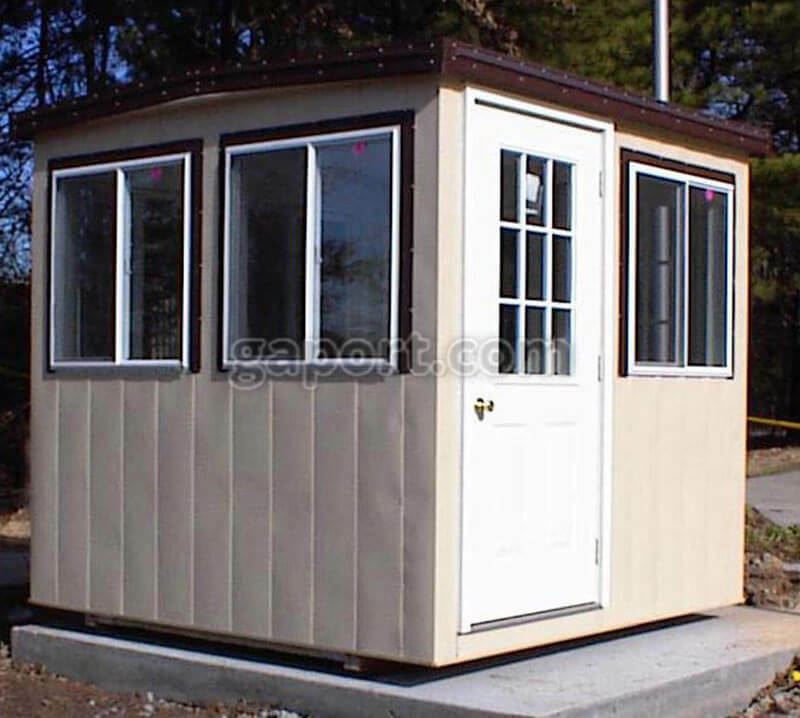 The layouts of our prefab guard shacks can be catered to your needs. 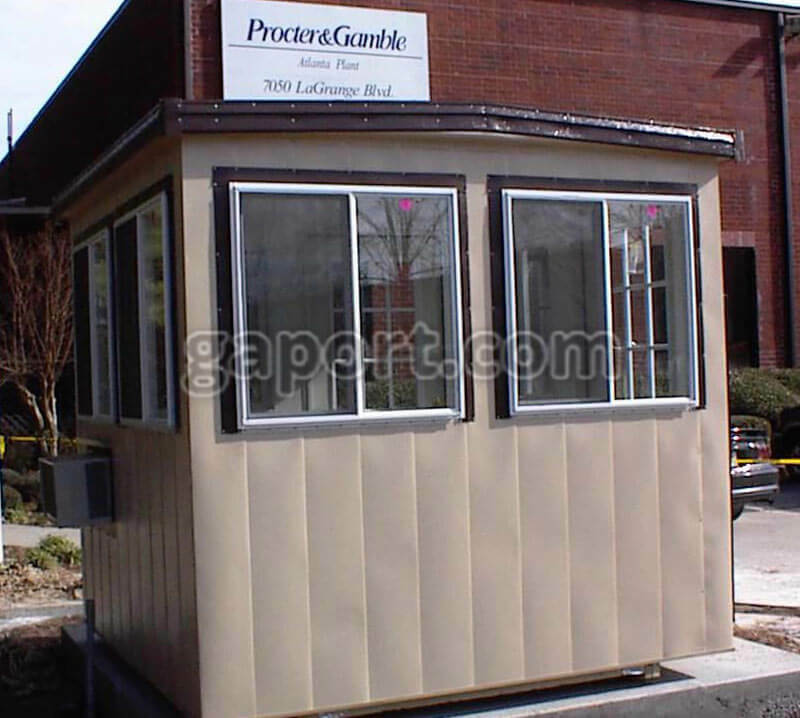 The 8x8 guard booth is a topnotch building, which can include a number of options including an HVAC unit, electrical panel, phone jack, and a 20” deep laminated counter top. You will find our 8x8 security booths being used in a number of applications such as construction site offices, secure gate entries, airport section access, scale houses, security offices, or in plant offices. 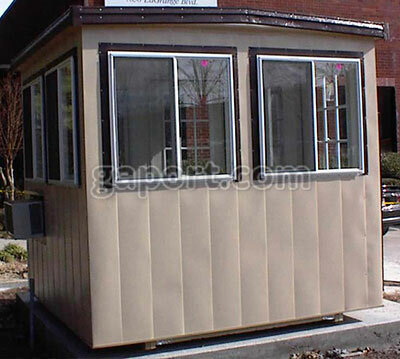 For maximum protection our 8x8 guard booth comes standard with galvanized steel rolled roofing over 7/16” roof decking. A 3” overhang is built-in on all four sides. We also offer longer eave options and a no eave option if there are measurement constraints. The building wall studs are on 16” centers and covered with ½” OSB sheathing for added protection against denting. The exterior is then finished with flat style aluminum siding in your selection of colors. The aluminum siding will not rust and is therefore maintenance free. 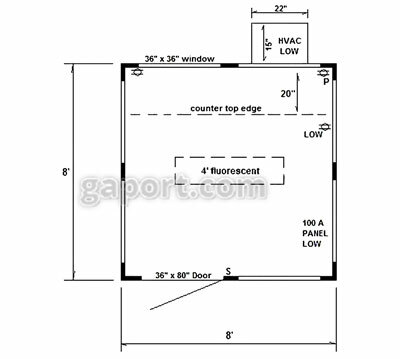 A 36” x 80” metal insulated exterior door with knob lock and deadbolt is included. We also carry alternate door options such as the popular sliding glass door. Both the walls and ceiling are insulated with fiberglass to keep warm in the winters and cool in the summer. Our sturdy and easy to clean walls are finished with vinyl clad gypsum. Our ceilings are finished with gypsum and in a sea spray texture. The standard 8x8 security booth height is 84” on the interior walls. However we offer a 90” interior wall height if desired. Your guard booth is typically equipped with a wall mounted HVAC unit with thermostat. These range from 8,000 BTU to 18,000 BTU depending on the size of the unit. 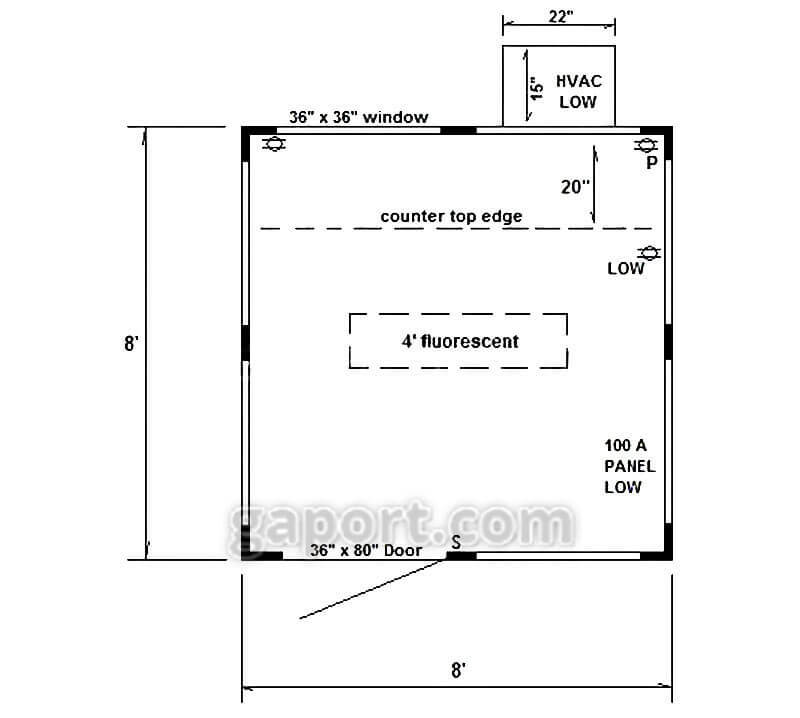 Other heating options include a fan forced wall heater or baseboard heater. These are especially recommended in northern states. 3 duplex receptacles come standard in the 8x8 unit however more outlets can be added. A 100amp electrical panel with main breaker is also included. An interior 4’ fluorescent light with acrylic lens is typical and exterior floodlight fixtures are available for added security and visibility at night. We have several counter and shelf options. The 8x8 unit comes standard with a 20” deep laminated counter across an 8’ end; however another counter can be added depending on the need. Your security office can be equipped with adequate places to hold computers and other tools, while remaining easy to move around in. A typical floor plan (pictured above) shows our most popular 8x8 layout. Standard 8x8 guard booth units include the following options: 3 outlets, 20” deep laminated counter, HVAC unit, 100 amp panel, and an interior fluorescent light and switch. 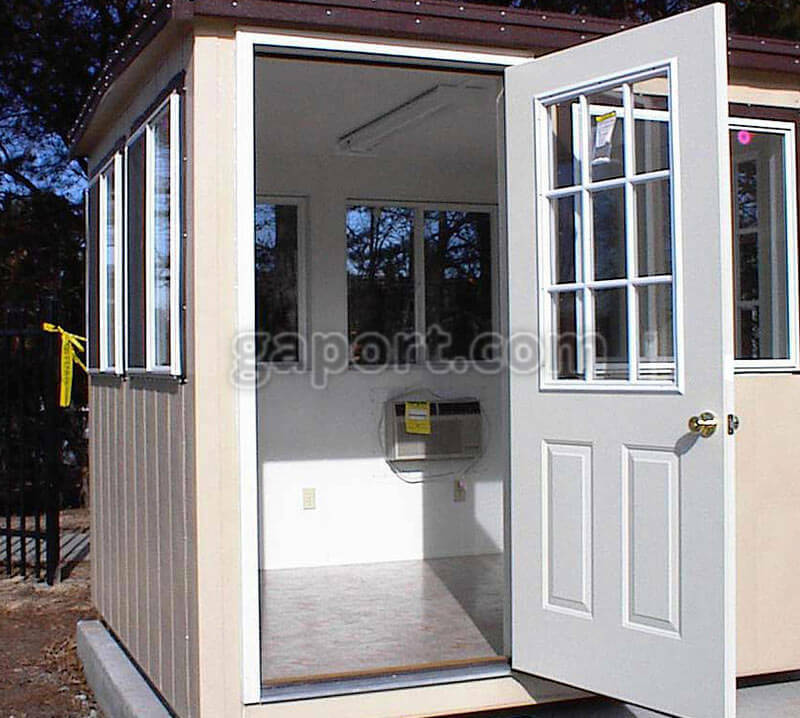 Keep in mind however; all our layouts while offering a good price for guard booths can be affordably customized. Please feel free to contact us by phone or by requesting a complete quote online here. 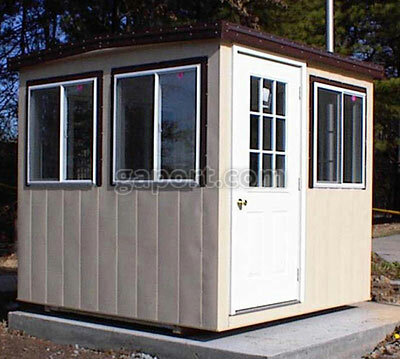 We will work tirelessly to accommodate your request and design the finest guard houses to meet your security needs. Do you have a need for a great security shelter, but have limited space? Not sure if your budget will allow? 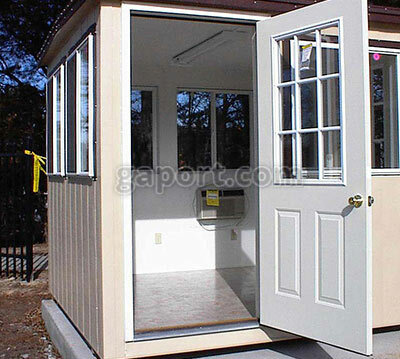 Call us and one of our guardhouse experts will assist in finding the right guard booth for you.